When I don’t know what to make for lunch, I often fall back on an old favourite – a ploughman’s lunch. For the uninitiated (or rather, un-British), a ploughman’s is basically just a nice spread consisting of bread, cheese, pickles and chutneys, apple, salad… lots of tasty bits that go really well together, on a plate. It dates back to the 1950s, and came about as a result of wartime rationing, as a lot of traditional British recipes do. According to my trusty friend Wikipedia, when cheese stopped being rationed after the war, the Cheese Bureau started promoting the ploughman’s lunch to increase cheese sales. Sorry for the history lesson, I just found that really interesting! Anyway. A major selling point of a ploughman’s lunch is that it’s really easy to throw together – just raid the fridge and see what you come up with – but let’s not forget that it’s seriously tasty too. Cheese and pickle on bread? Literally can’t go wrong. Since I’m always in favour of mixing things up a bit, this time I served my ploughman’s in burger form – because why the heck not? Everything in a ploughman’s goes just perfectly on a burger. It’s a no-brainer. Start with some good bread. I like a hearty wholemeal roll – it adds to the rustic feel! Then, you need a really good chutney. I used this red onion marmalade from a small brand called Farmhouse Kitchen. Don’t be put off by the ‘marmalade’ – as it says on the jar, it’s just a cheffy way of saying chutney. It’s absolutely yummy – it’s slightly sweet, just as it should be, and it will add a huge amount of flavour to your ploughman’s burgers. You can get your hands on some of this lovely chutney from a site called Caprera, which sells really beautiful food products from small, independent producers. I absolutely love the fact that you can read all about each brand – I loved reading about Mo from Farmhouse Kitchen! It means so much more buying things from independent producers like Mo than from a huge corporation who has enough money already, and probably doesn’t pay their taxes anyway. Caprera is a lovely way to discover small businesses who are really passionate about their products. Once you’ve slathered a good amount of chutney on your roll, it’s time for a few salad leaves, and some thick slices of cheddar. Use a mature one – a nice crumbly one. Only the best for a ploughman’s (burger). Make sure you use a fairly mild-flavoured burger for these – stacking your ploughman’s up with a spicy burger that totally overpowers it would be entirely wrong. If you want to make your own, my spinach and ricotta chickpea burgers would be a good option – they’re totally yummy, but fairly mild in flavour, so they’ll fit nicely with the tasty chutney and mature cheese. Last but not least, some sliced apple (<– sounds weird, totally works) and another good dollop of that chutney for good measure. Oh, and don’t forget to serve it with a tankard of beer or cider. I tried the ‘original garden cider’ from The Garden Cider Company (aka Ben and Will! Love those little producer bios), which you can also buy from Caprera. It’s a proper English cider – not too sweet, and just perfect alongside a ploughman’s burger. Cook the veggie burgers according to the instructions on the packet. Cut the rolls in half, and spread the onion chutney over the bottom of each. Top with a few salad leaves and a couple of thick slices of cheddar. When the burgers are cooked, add them on top, along with the sliced apple and another dollop of chutney. Replace the tops of the rolls, and serve immediately. 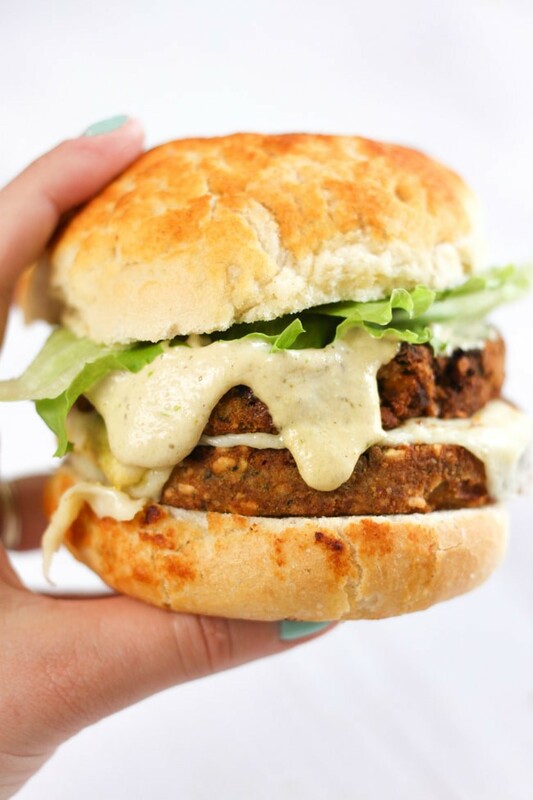 Looking for more ways to liven up your favourite veggie burger? You have to try my homemade burger sauce – it’s unbelievable! Anyway, to make up for the cheating burgers, I made the chutney myself as I happened to be in possession of a book with a recipe for it. Took a little longer to make than I thought but was otherwise stupidly easy to make. And now we have half a jar of chutney left over in the fridge. Win! This is such a lovely burger, looks delicious. I am gonna try them soon. What a gorgeous lunch! Caprera sound like a really decent company. I’m all for supporting the smaller producers! I’ll go check them out! This sounds totally amazing! I love a decent ploughman’s because it includes so many of my favourite foods. Becca this looks sooo good!!! And Can I tell you…I LOVE the Quorn products! They are just fantastic!!!! LOVE LOVE LOVE!!!! Thank you for introducing me to them! Oh yay!! I’m so glad, I really love them too (my freezer is probably at least 40% Quorn haha!). I have another Quorn recipe coming up next week actually :) Which products have you tried? I tried the chik’n nuggets, and the buffalo nuggets and the crumbles are in my freezer now to try out next week!!! I’m giddy with excitement!!! Not that you are a vegan…but I did try the Whole Foods vegan lasagna and it was off the hook!!! Seriously delish!!! This looks amazing, I love a good ploughmans, popping those flavours in with a burger is just genius, will be trying this ASAP! Oh my goodness this sounds amazing! What a fabulous idea. Thank you for sharing, I cannot wait to try this. Those chick pea burgers of yours look delicious. I love all the extras in your burger to make it a proper Ploughman’s. Good quality chutney and cheese is essential. A ploughmans burger sounds right up my street. I totally agree with you that the best thing about a ploughmans is just throwing everything together.